Moving an office or business is a delicate task. The key to success is careful planning and experienced help! Use the following office moving checklist to ensure you’ve considered all of these key factors. Our move management services and organizational plans can be a great way to streamline an office move and minimize the impact on your business. Moving a business requires strategic planning and expertise – After all, the longer your business is in transition, the less you are working! Using a plan and experienced service providers will ensure your office move is facilitated efficiently and professionally. 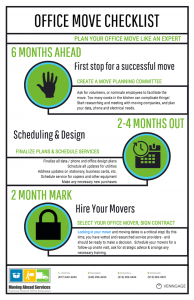 Click to download the office moving checklist infographic now! 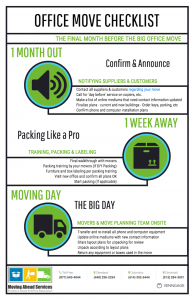 Download our full Office Moving Checklist today or preview below. Experienced, professional moving services for residential and business relocations.